Sometimes the simplest premise works the best, take a little it of Die Hard, add a dash of Towering Inferno and put the Rock between a hard place and you have yourself a summer popcorn flick. You smelling that? The Rock is cooking up a storm. 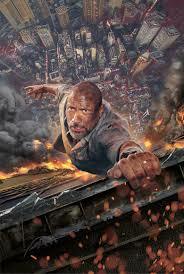 FBI agent Will Sawyer (Dwayne Johnson) is injured in the line of duty and losses his leg. Ten years later he’s married to surgeon Sarah (Neve Campbell) and they have two children and Will has set up a private security firm, his newest client is billionaire Zhao Lung Li (Chin Han) and Will has been hired to assess the security of Zhao’s super tall tower, the Pearl. At 220 floors high, the Pearl is the tallest structure in the world with the upper levels not yet available to the public until Will evaluates exactly how safe the tower is. While Will reunites with old friends, Sarah and the kids are living in the upper levels, unbeknownst that a group of terrorists led by top syndicate enforcer Kores Botha (Roland Moller) infiltrate the lower levels and begin their plan to set fire to the Pearl. After a second team gain control of the Pearl’s offline cyber security facility, they deactivate the safety systems and within minutes a fire spreads all across the middle levels, directed upwards through the ventilation shafts, turning the world’s tallest building into a chimney. 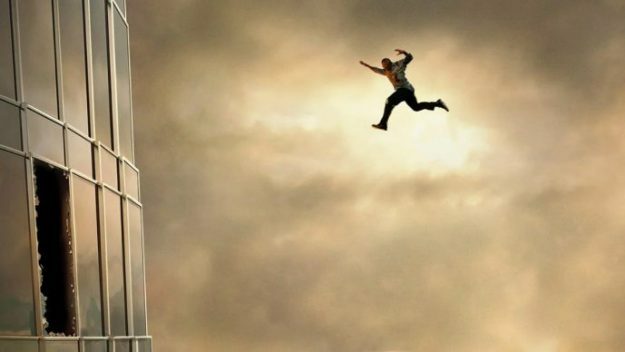 Will-learning of his old friend’s role in this plan- heads towards the Pearl to rescue his family who are trapped on the upper levels. Defying the Hong Kong Police, he climbs a construction crane and leaps into the fray, fighting fire and the terrorists to rescue his family and save Zhao from Botha, who wants a mystery McGuffin that Zhao has. 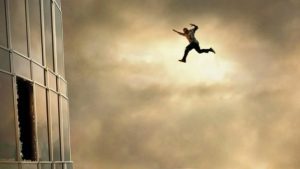 Skyscraper is the height of absurd fun, and it helps that Dwayne Johnson can make just about anything work, and he’s committed to it, he even walks and runs as if he where if an actual prosthetic leg. The run time is comfortable and the pacing takes you through it steadily without forgetting that it’s a race against time, and the death defying stunts are not for the faint hearted. Just good clean fun from beginning to end. Remember- if you can’t solve a problem with duct tape, you’re not using enough duct tape. This entry was posted in Blog on July 16, 2018 by SETV.